Have you made a New Year’s Resolution yet? Well, if you haven’t, I recommend you don’t! Instead, consider beginning with a few goals that are realistic and attainable. Aim for success in the “first quarter” and you’ll feel better moving on through the year and setting more goals. 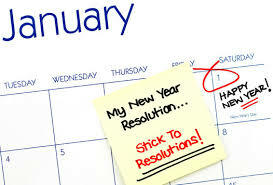 Wondering what the difference between a goal and a resolution is? Resolutions – are often abstract, they may have a vision but rarely include the details. Goals are specific, measurable and have a timeline associated with them. Don’t Make a Resolution, Create a Goal! 1) BE kind to yourself – Don’t try taking on too much at once – set yourself up for success! 2) DEfine your goals – write them out in detail and what “success” will look like to you! Business – Is it completing a business plan, installing a new filing system, or going paperless? Home – Is it painting a room, getting the garage organized or cleaning out specific closets? Good Habits – If it’s a habit, commit to the practice, not perfection. Start with small changes and permit yourself time to build the habit slowly. You can always increase your goal as continue. Need some encouragement or ideas? I’m just an email away and would love to help you define and execute your goals!